How much trouble is Barack Obama in over the extremism of Jeremiah Wright? Enough that Dem strategist Donna Brazile has been reduced to arguing that as black preachers go, Wright is relatively moderate. Enough that the normally affable Brazile got a bit short with Time editor Mark Halperin, he of the infamous memo to his subordinates during the 2004 presidential campaign while serving as ABC News political director. The comments came during the panel discussion on today's This Week with George Stephanopoulos on ABC. GEORGE STEPHANOPOULOS: Why did this bubble up now, I guess, and why didn't he get ahead of it before? DONNA BRAZILE: Because, look, we're at a moment in the campaign where the kitchen-sink strategy is in full force, the vetting's in full force. Sorry, but choosing as his personal spiritual guide someone with Wright's hateful views isn't mere kitchen-sink material. It is central to the question of Obama's judgement and values--and hence his fitness for the presidency. Brazile continued. BRAZILE: We’ve known, I mean I've known Jeremiah Wright and actually Jeremiah Wright is one of the more moderate black preachers. Just go to the church down the street from my house and I see women coming with their hats on the other side of their head [as Donna demonstrates in the screencap] because they have been lifted up. MARK HALPERIN: Here's why I think it mattes a lot. The only chance Hillary Clinton has of being the nominee, the only chance I believe John McCain has of beating Barack Obama if they face each other if is he is defined as an unacceptable, either general-election candidate for the Democrats, or president in a general election. And this goes, I think the biggest challenge he's faced on that front. He's still introducing himself to the American people. The right-wing attack machine, cable news, talk radio, the internet, went crazy on this and they will not stop. They are pursuing right now the very question you [Stephanopoulos] and George [Will] discussed. George asserts blithely that Obama has sat through these types of sermons. As you point out, the Obama campaign says he has not. If he has, if there's evidence of that, he's in big trouble. Two questions for Mark Halperin: when's the last time you used the expression "left-wing attack machine"? And if this issue does, as you say, go to the essence of the Obama's candidacy, why are you forfeiting the game to your media competition? Why didn't you include your own Time magazine among those all over the story of what Obama knew about Wright and when he knew it? It was a bit later that things got a tad testy. 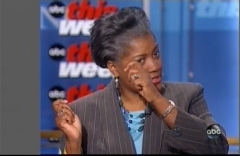 BRAZILE: But it doesn't fit [Obama's] narrative. His narrative is someone, is someone who is trying to bring reconciliation. And that [Wright] generation wanted to basically talk about recrimination. And I think that's the strong thing that Barack has to navigate. I'm sure he sat in church when the preacher said something that would make white people uncomfortable. I've sat in church when I've been uncomfortable. BRAZILE: He has repudiated and denounced those comments. What else can he do? He's not going to renounce the good Lord Jesus Christ. So what is the purpose? STEPHANOPOULOS: What else can he do? My take: Obama's big problem is that there might not be much he can constructively do. Denouncing Wright only takes him so far. As Will had earlier pointed out, "the reverend did not pick Obama. Obama picked his pastor." Condemning Wright isn't going to get it done. Obama might just have to admit to bad judgment on his own part, and pay the political price.